Home > Learn > The Basics > Alzheimer's FAQs > How are depression and dementia related? As we work to unravel the mysteries of Alzheimer’s disease and other dementia, one of the more interesting areas of research is depression and its connection to dementia. It appears that depression impacts people with dementia in at least two different ways. First, individuals who have had significant depression in their lives may be at greater risk for developing dementia. Second, many people with dementia have depression; left untreated it makes confusion and forgetfulness worse, damaging quality of life. Let’s discuss both these aspects of depression and dementia. A number of studies have suggested that there is a link between depression and dementia. It now appears that individuals with long histories of clinical depression (particularly depression that goes untreated) have a greater risk for developing dementia. In a 2010 study in the journal Neurology Doctor Jane Saczynski of the University of Massachusetts, found that depression at a younger age is a significant risk factor for dementia. While the reasons are unclear, she speculated that inflammation that occurs when a person is depressed may be a contributing factor. In addition, certain proteins found in the brain increase with depression; these also may be increasing the risk of dementia. It’s important to note that a risk factor is something that is likely to increase the chances that a particular event will occur. Having a risk factor for Alzheimer’s disease doesn’t mean that you will ever get Alzheimer’s disease; many people with histories of depression never get dementia. What should an individual do if he or she has depression, particularly at a younger age? Common approaches include medicines and talk therapy. Many people with depression benefit from increased activity and socialization, including things like exercise, meditation, time with children and activities involving pets. Even if we don’t fully understand the mechanisms at work within the brain, there is no doubt that a long period of depression may lead to isolation, inactivity and hopelessness. David Troxel, noted dementia care expert says that, “the brain loves company.” When you can overcome depression, it is clearly good for the brain. 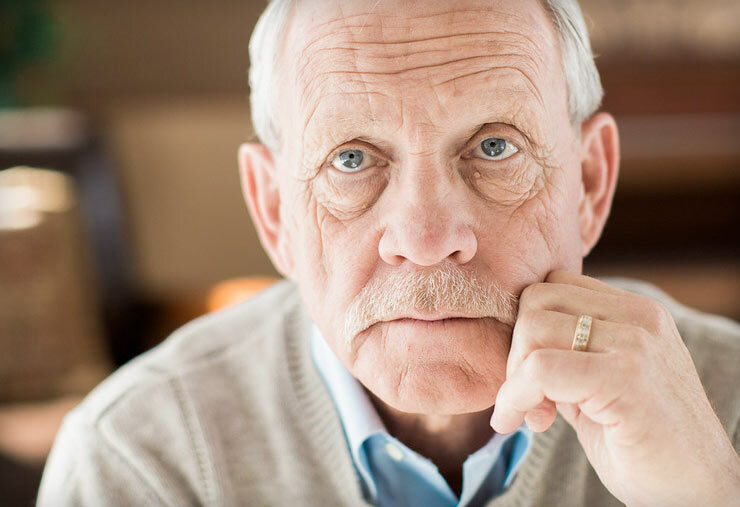 How can you tell if your family member who has Alzheimer’s disease or dementia is depressed? Common signs include anxiety, sadness, lack of appetite, spending more time sleeping, weight loss and agitation. Sometimes they will express painful, upsetting thoughts or make negative comments like, “I want to die,” or “I’m so alone.” These are words that caregivers should pay attention to as they are signs of depression. Many persons with dementia may not be able to tell you they are depressed, but actions communicate a message. For example, a person with dementia who always loved gardening will most often still respond to an activity involving flowers, for example arranging flowers in a vase or taking a walk outside to see roses in bloom. A person with dementia who is depressed, develops apathy, refusing to do the things they’ve often enjoyed in the past, even things they’ve enjoyed fairly recently. If you suspect that your friend or family member with dementia is depressed, seek help from your physician. There are several tools that your doctor or a neuropsychologist can use to assess and treat the person. Anti-depressant medicines seem to work well. Activity is also a way to treat depression in persons with dementia. Step up your exercise to twice a day, get them outside in the sunshine, encourage attendance at a day program, or hire in-home workers who will engage them in conversation and activities. Perhaps the answer is “hugs and drugs.” When we treat the person’s depression, we can bring the person back to a higher quality of life, for them and for all of us as well.